I recently received an email from a known habitual liar & manipulator known as Sacerdotus, which I posted below. Here is his background: https://sacthevirus.wordpress.com/2014/12/01/warning-online-virus-of-a-person-called-sacerdotus/ A rather large number of people both Christian and nonbelievers have challenged his lies and caught him in many deceptions. In fact this email is from a proven fake identity controlled by Sac himself. His veiled threats are very common. He vaguely promises all kinds of legal action to get challengers to back off. Since I don’t care for his threats and stealing of my graphics, I have asked for his case number for my lawyer to review. I expect he will make many excuses as always to not share ANY details of his claim. After all a liar lies. And by the way, I haven’t been bothering with him at all recently, so this is probably ALL to drum up attention for his blog. So anyway, here is the email… what would you do? I really don’t understand what is your problem with Michael. You really need to stop it. He has already contacted an organization of Catholic lawyers who assist Catholics pro bono. Others are documenting every tweet and blog post that you and your friends produce and are clearly aware that you and your friends are the problem. Do you really want a legal case against yourself? Can you afford legal fees etc? Think about this carefully. Is all of this worth it? All Michael does is post blog links. While they may be extremely critical of atheism, there is no harassment. He never mentions people randomly insulting them and often ignores mentions and comments on social networks. There is no way you can claim that he is abusive. The evidence is just not there for your case. On the contrary, he has lots of evidence via tweets, appearances by you and Ellif on his Google +, blog posts etc showing the abuse, libel and harassment against him. In a court of law, you and your friends will lose. Depending on your area and its statutes, you can be liable for millions if a case is won against you. In light of the lawsuits regarding religious freedom, Michael can really do damage against you and your friends. Again, think about this. Is this worth it? My advice is for you to let it go, remove all of the defamatory and harassing content which can and will be used against you in a court of law. Again, Michael has done nothing wrong and you know this. Each of you are spiteful because he managed to get Esther permanently suspended. Had this not occurred, none of you would have taken time out of your lives to dedicate to libelous blog posts and tweets; not the mention the stalking on Google +. The pattern is clear. After his suspension, he went to Google + and immediately Ellif followed him, joined the same community and began harassing him there. He would even spam threads created by Michael with links so that members would not view his original post. This is clearly malicious intent and is considered damages. Then you appeared a month later attacking him over a debate which had nothing to do with you. All of this is being documented. You and your friends may think we are just ignoring it, but we are all collecting the information and forwarding it to this Catholic lawyers organization. In regards to the graphic you claim Michael misused, you are incorrect. I have explained to you about fair use in regards to parodies. You do not have a case of copyright infringement, moreover, you have not demonstrated legal copyright ownership. I am hoping you will be an adult about this and let it go, remove all the harassing content and try to be at peace. Michael is a good person. He may appear abrasive, but he is a good person and will help anyone even another atheist. Unfortunately, you are only seeing things via this child’s play game Esther (Rosa) created. It has to stop before it gets worse, legally speaking. 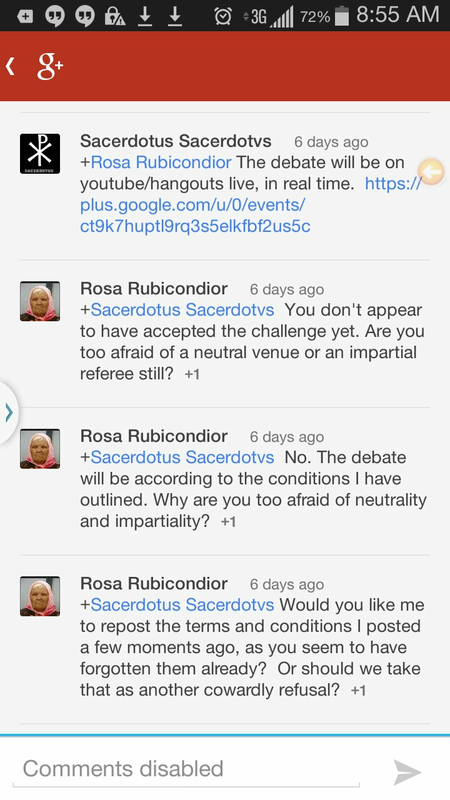 ATTN Sacerdotus… Rosa Rubicondior (who reveals your long term dishonesty HERE) never agreed to your Easter 2015 debate changes. This is a fact. What happened was you never agreed to Rosa’s terms and then set up a STRAWMAN DEBATE, which was your venue and rules, 100% without Rosa’s agreement. You then promoted this event as agreed upon by both parties. A CLEAR LIE. Obviously you were afraid to face Rosa and, like a child, had to manufacture the only debate in which you could ever defeat her… a fake one. Pure cowardice. As anyone can review here https://plus.google.com/u/0/+EllifDWulfe/posts/cPHRbLnqDzh around 2/3 of the way down the thread, Rosa issued a formal debate offer with FULL DETAILS and you immediately changed the venue WITHOUT Rosa’s agreement. You also never agreed to the rest of her parameters, rules or content. You, like a demanding 4 year old, insisted that Rosa HAD accomodated you, even making a self narrated video STATING THAT SHE AGREED!? The video “evidence” never shows Rosa’s agreement despite you claiming it does… An OUTRIGHT LIE. So you posted that the debate was arranged and agreed upon and you predicted that Rosa would back out. BACK OUT OF WHAT you lying turd? She never agreed to your FAKE & DISHONESTLY arranged changes or venue. Now that Easter had come and gone you victoriously post claims that Rosa has run away from debate again, when all you’ve done is create a type of STRAWMAN DEBATE! You pretended that YOUR venue and rules for debate were actually what was taking place. Your dishonesty and despicable behavior, just to make some folks believe that you are winning or are an intellectial, is absolutely mind blowing! Clearly you are not one to be trusted with things that require integrity. Its a good thing that there are people like Rosa who challenge such childishly dishonest, religious folks as yourself.